Is there anything more fun than turning something tired and forgotten into something new and beautiful?? Amazing friends, welcome to Trash-to-Treasure Tuesday!! This is one of my favorite days of the month! Not only do I have a pretty makeover for ya’ll, so do four of my favorite blogger friends! Be sure to look for their projects at the bottom. 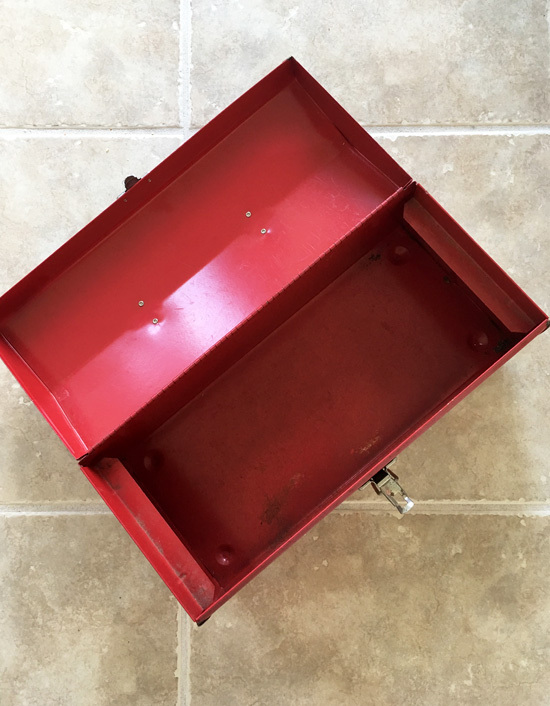 Other than being quite faded, this metal tool box was in really great shape. So for $7, I threw it in my cart and dragged it home. And with the magic of paint, it is fancier than it ever thought it could be! 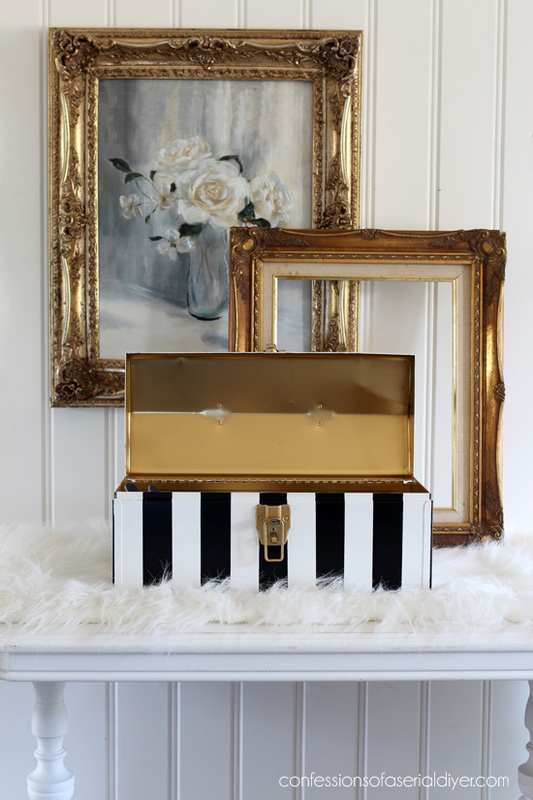 You knew it would be painted, and you know I love me some stripes, but you probably didn’t expect the gold, right? I started by spray painting the front latch and the handle with this gold spray paint. I also spray painted the inside gold as well, and I’ll share that in just a bit. Then I painted the rest in Behr’s Bit of Sugar made into chalk paint. (Recipe with video HERE.) I used a smaller than normal brush so I could cut in more easily around the gold parts. Then I used my favorite FrogTape for delicate surfaces to tape off the stripes. I painted the black with this acrylic craft paint. 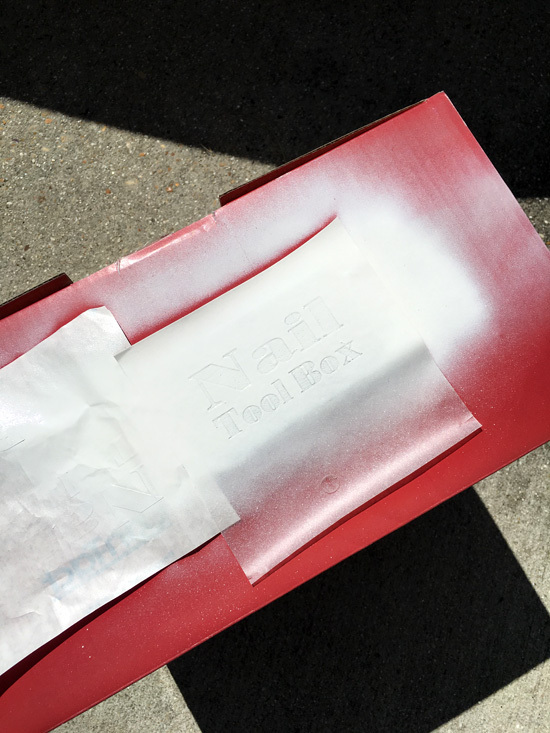 I sealed it using this spray matte sealer. I thought it needed something on the top and that cute tag was just the thing! Then I drilled a hole for the ribbon. I also sealed this with the clear matte spray sealer. As I mentioned earlier, I painted the gold when I painted the handle and latch. I found the small square bins at Target. They fit perfectly! 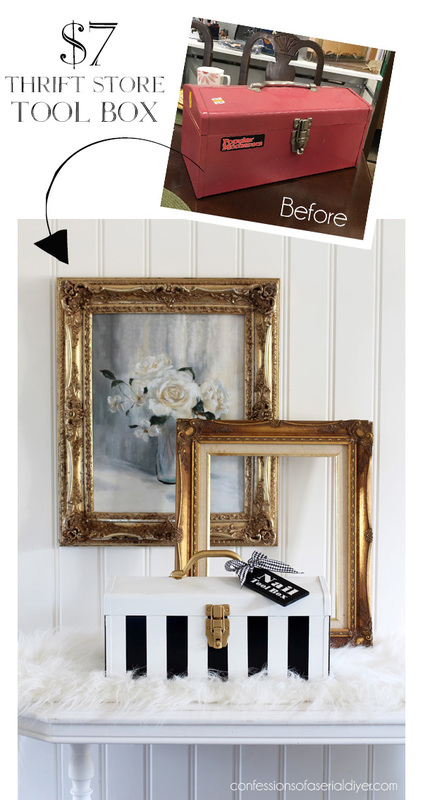 I hope you enjoyed this fun makeover! Don’t forget to check out what my friends are making over today as well! Want more trashy makeovers? 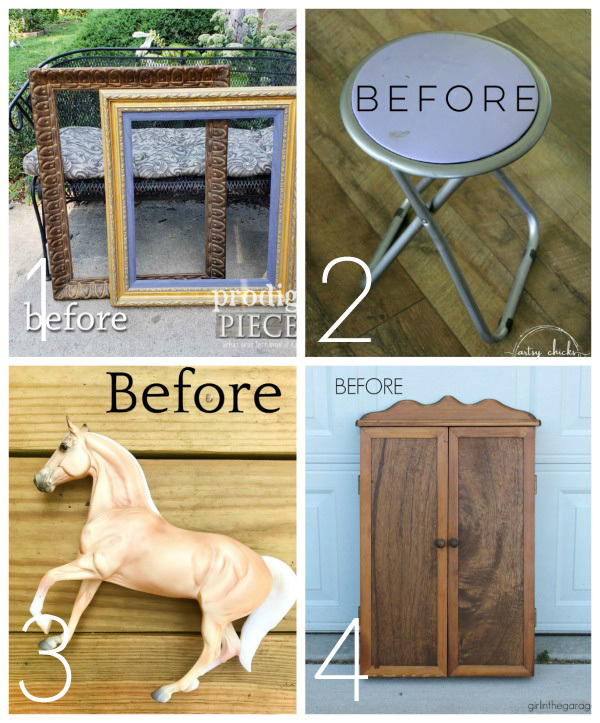 See all of my Trash-to-Treasure Tuesday makeovers HERE! Meet me back here Thursday to see how our front landscaping turned out! Hoping Hurricane Florence doesn’t wash it all away. To everyone in her path, please stay safe!! UPDATE: See how our new front landscaping came together HERE! WOW, totally amazing. I love it, you are the most creative person I know. I love how that turned out! You never cease to amaze me!! Christy this is so clever and cute! I adore how your mind works. Is this going in your booth or staying with you? Wishing you safe with Florence. Christy!! This made me giggle out loud! hee hee! 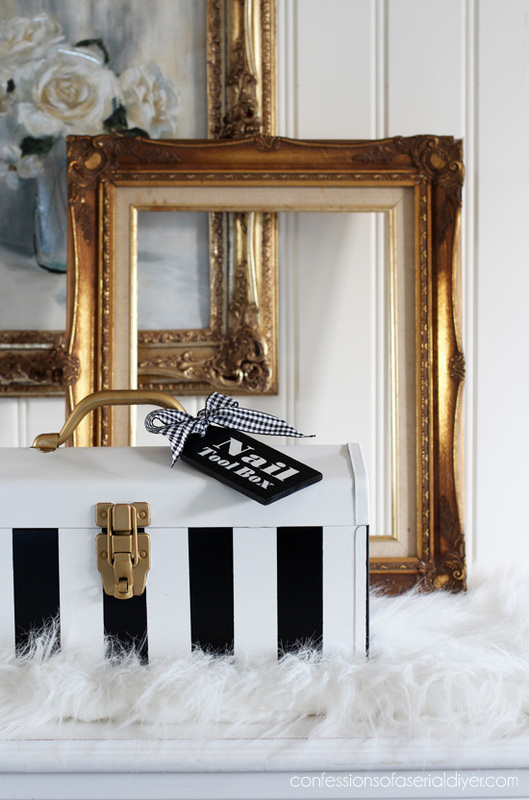 So glamorous and cute…you “nailed” it. 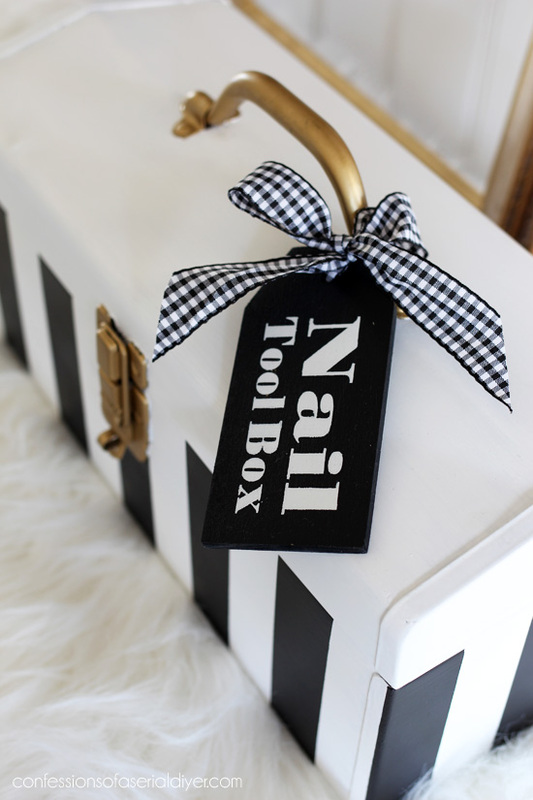 😀 Me thinks every hubby better hide their toolbox! 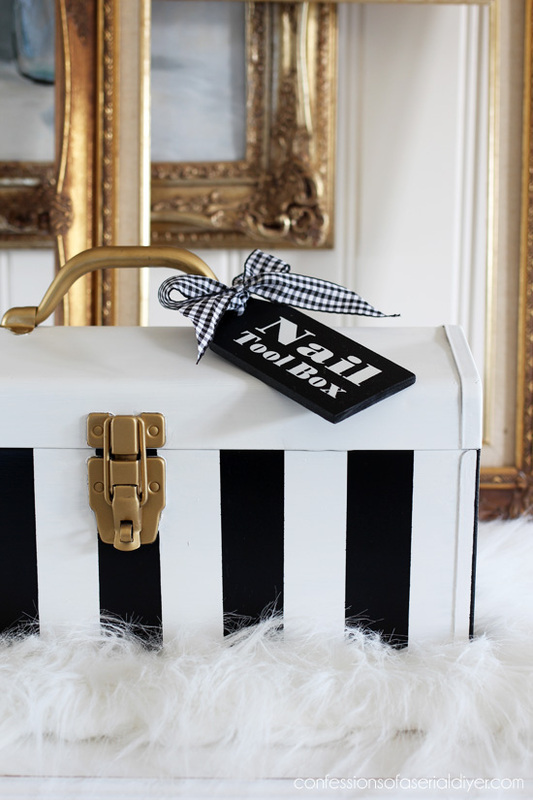 That “tool box” is adorable! I am always amazed at the ideas you have. And not only that you come up with them, but execute them so beautifully. Love your vision and talent!! 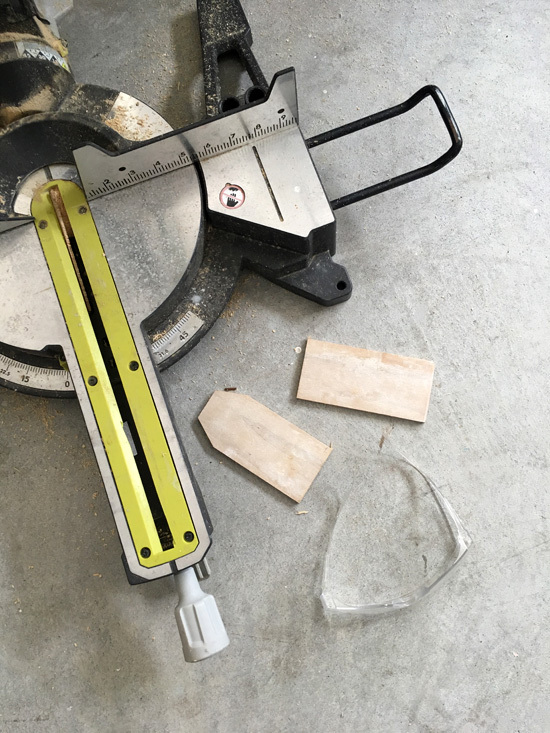 “I just chopped it into shape with my miter saw” You make it all sound so easy! LOL Pretty chic, I like the gold. I have a couple of these that were my dad’s……I really don’t like the idea of letting them rust outside as a planter, so this or something similar might be a good idea for them!! You can make chicken salad out of chicken feet! This is just adorable! 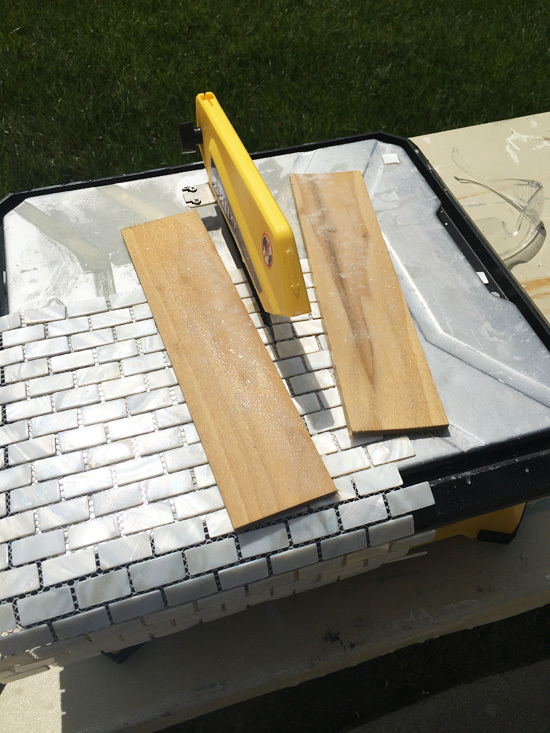 I am going to use the idea as a gift for my niece…she will love it as she is also a DIY addict. I love your creativity and resourcefulness. I love this idea. So cute! Before I realized what you were doing with it I showed it to my husband and told him how cute I thought it was. 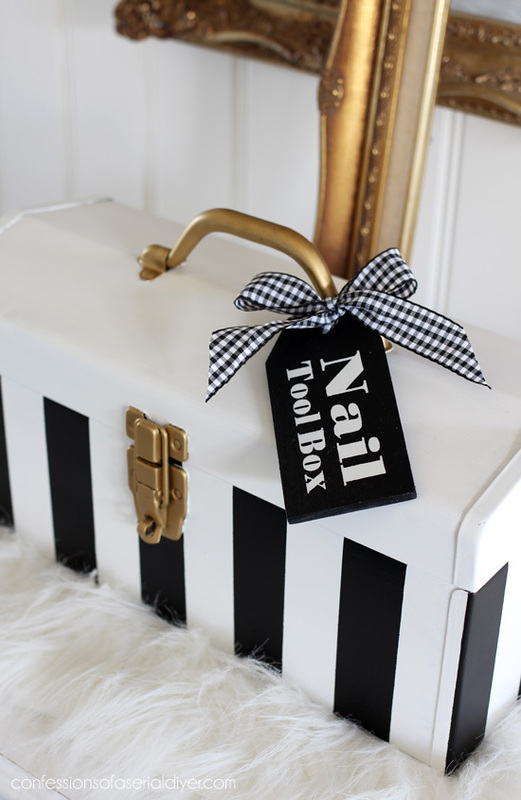 He was a little confused as to why someone would paint a tool box and said what would you use it for and the first thing that came to my head was nail paraphernalia and then scrolled down and saw the open box! So beautiful! Also, was thinking about you and the upcoming storms, I hope your area is not affected🙏🏻. So pretty! 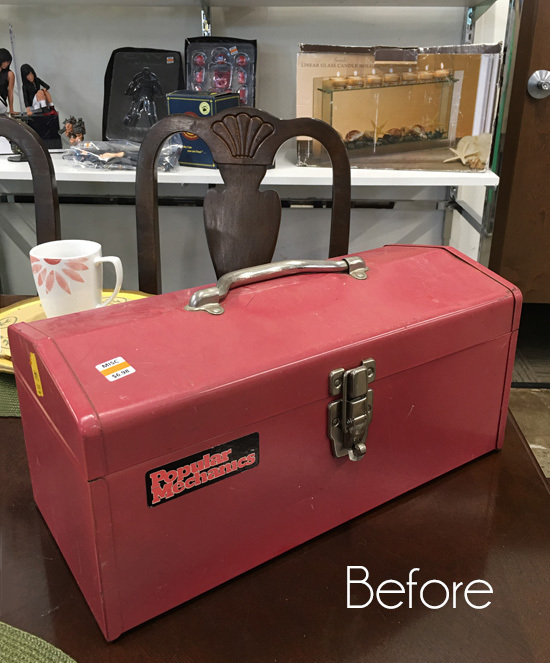 I just happen to have a lovely yellow tool box I snagged a while back waiting around for ideas. My husband was going to steal it but no way! That thing is MINE! I LOVE this!!! Cute, clever, practical. MUST do this one. Thanks so much for sharing your inspiration and talents. Ohhhmmmmgeee I love this!!! I have one sitting in my garage and was deciding what to do with it! Thank you!!! I have a problem with applying the Rustoleum Clear Matte Spray. Sometimes it buckles the paint below it into an “alligator skin” look. It doesn’t happen all over just in some parts. Do you know why this happens? How do I prevent it? this is DARLING, and I don’t even polish my nails! I’ll Pin this one for another purpose! LOVE IT!!!! Spot on perfection!!! 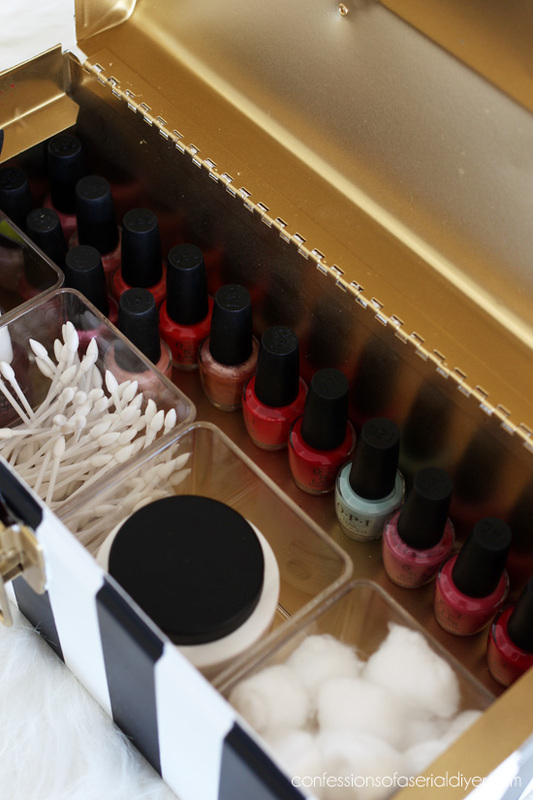 !….and it sure beats the old shoe box I use!!!! You are a whizz with that spray can. 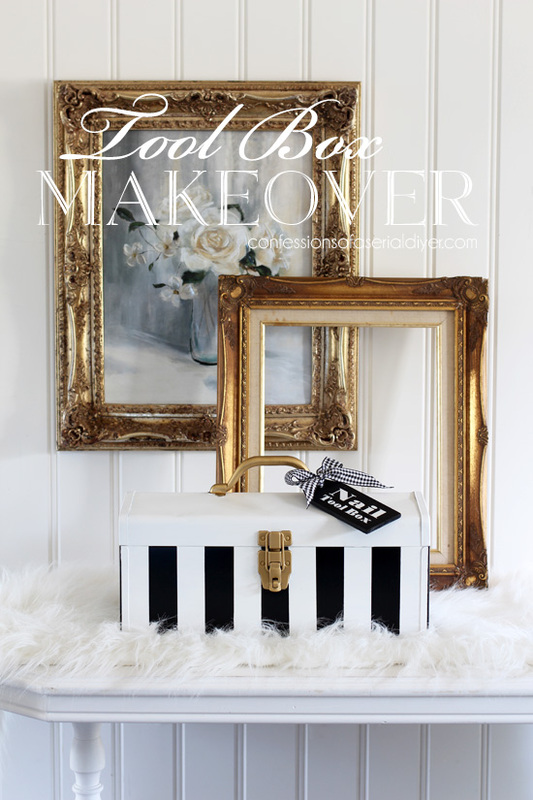 You are so dang clever, just love this makeover and you made it so useful too! 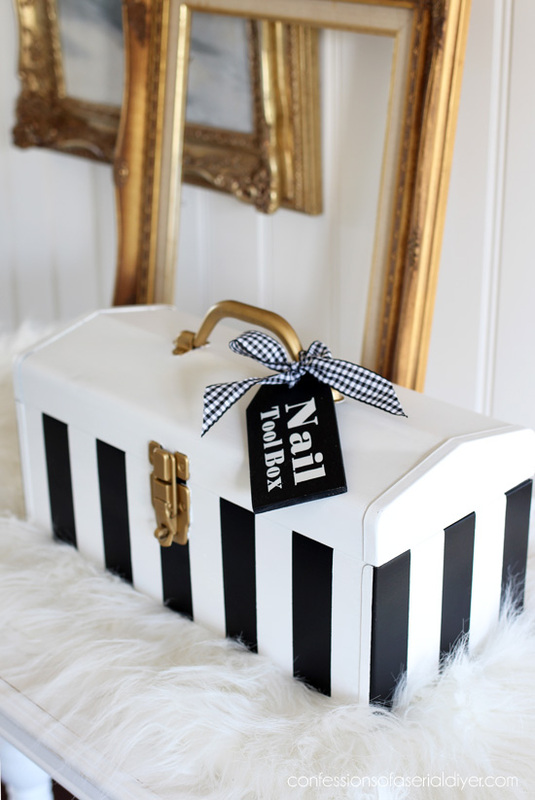 Christy, This is just the cutest idea, and who doesn’t need a fun way to store the nail polish and supplies!! Fabulous! Wow! Even though it’s totally not my style, I think it is great! Woowwww!